I’m wall art crazy at the moment and while there are more than enough options on the market to fuel my passion, I’m always searching for something new. This week I came across the summer collection from popular UK designer, Rachel Powell, and I just have to share them with you. 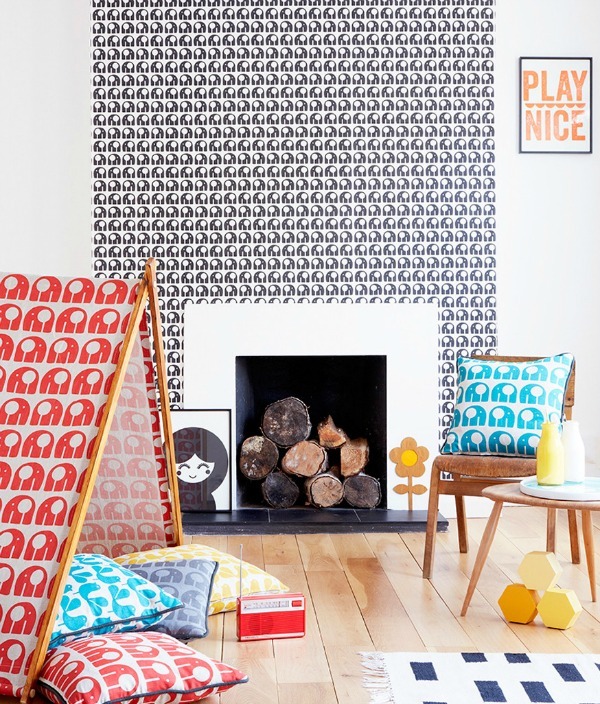 Rachel Powell’s signature playful designs can be found in an exciting collection of wallpapers, fabrics and interior products. Her summer collection is bold, bright and stylishly retro. Mini Me is a series of four prints that have been hand screen printed (pictured at top). The bold black and white prints of a Yoko doll is softened with an adorable smiley face that you can’t help to return and the pastel colours in the background images of two of the prints add to the playful tone. Each print in this collection measures 30 x 40 cm and can be purchased separately for £18 each. The brand new Nelly Wallpaper is perfect for adding a dash of quaint to a contemporary geometric style that will suit big and small kids alike. This Scandinavian inspired elephant wallpaper is available in vintage blue or super stylish black and white and measures 52 cm wide and ten metres long and costs £68 per roll. 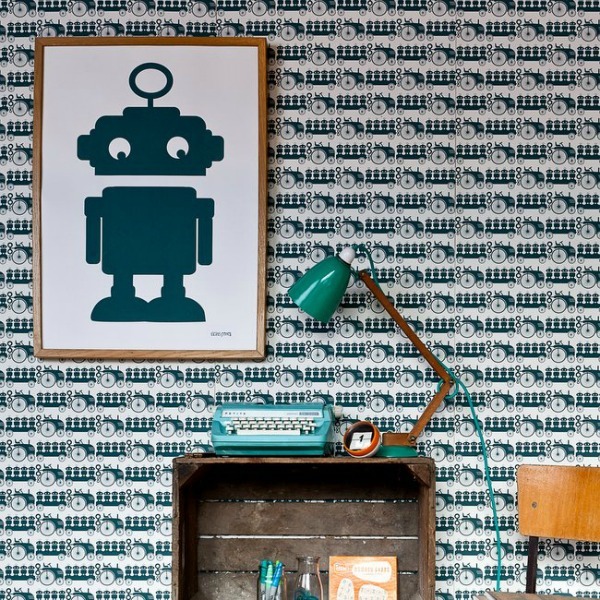 The Deere John wallpaper (pictured below) in dirty teal, iron grey or pepper is also worth a look for a boys room. Pair it with a Rachel Powell robot print and you’ll be instantly styling a vintage industrial look. The full selection of Rachel Powell prints and wallpaper can be found at her online shop. 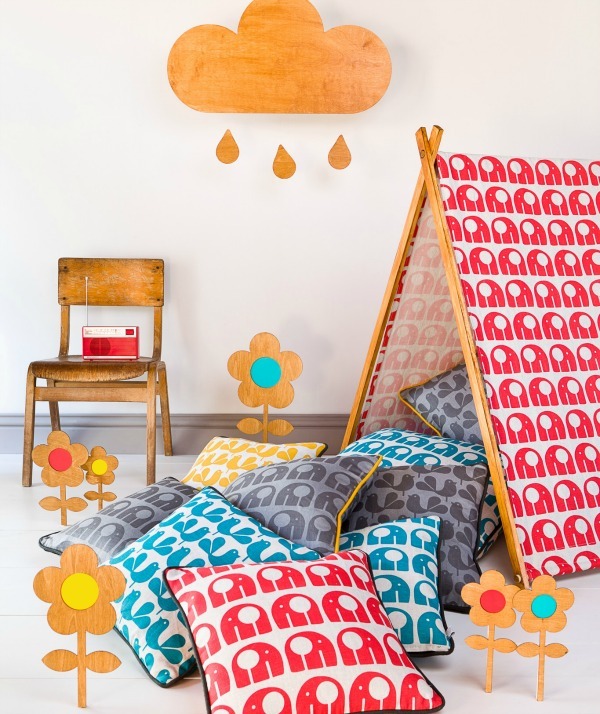 You’ll also love her range of cushions, tea towels, plates and mugs for bigger kids. Rachel Powell is based in the UK but does ship worldwide. For more of our favourite wall art check out these posts on Mini Learners, robots and these Etsy alphabet prints.